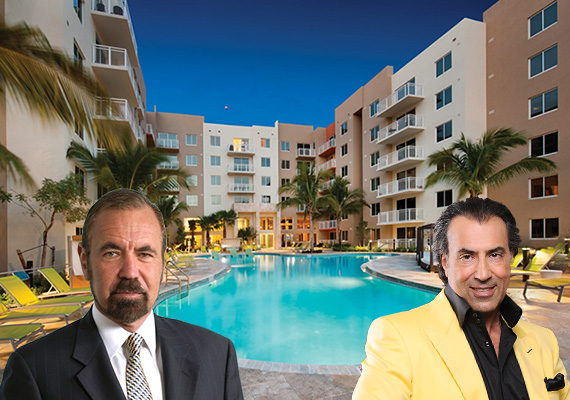 The Related Group, Shoma Group and PGIM Real Estate Investors just sold a piece of CityPlace Doral. Property records show the developers sold the Manor at CityPlace, at 3450 Northwest 85th Court, to TA Realty affiliate FHF I Manor Doral for $135 million. The deal breaks down to nearly $343,000 per apartment. Related and its partners completed the 394-unit luxury apartment complex in 2014 and secured $74 million of long-term debt for the property in May 2016. It was fully leased at the time. The six-story building sits on 5.8 acres just southwest of the shops at CityPlace. Rents at the Manor range from just over $1,600 for a studio apartment to nearly $3,000 for a three-bedroom. The development was also offering two months of free rent, according to its website. Amenities include a pool with cabanas and day beds, putting greens, a 24-hour gym, sports lounge, dog park and waterfalls. The buyer, TA Realty, has typically owned office and industrial properties in South Florida. Earlier this year, the Boston-based asset manager sold a Waterford at Blue Lagoon office building for $11 million and an $855 million national portfolio of office and industrial real estate. Related has been busy on the multifamily side. The company recently secured three construction loans for rental projects in Tampa, Royal Palm Beach and Orlando. The Miami-based developer and its partners held a grand opening for CityPlace earlier this year. Overall, the $800 million mixed-use project spans 55 acres and includes 40 retail, restaurant and entertainment tenants anchored by the 550-seat CinéBistro, more than 1,000 residential units, including 150 single-family homes developed by Shoma, 700 rental apartments and 320 condos. PGIM is an equity partner on portions of the development. It was designed by Arquitectonica’s Bernardo Fort-Brescia. CityPlace joins Codina Partners’ Downtown Doral and other mixed-use, large-scale communities new to the suburban, sprawling city.